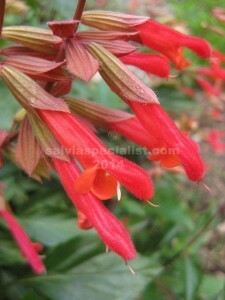 ‘Ember’s Wish’ is a sport of ‘Wendy’s Wish’ discovered in Plant Grower’s Australia’s wholesale nursery. It grows and flowers similarly to ‘Wendy’s Wish’ which means it is around a metre high, evergreen and flowers a very long time. It is suitable for most areas of Australia but probably doesn’t appreciate very dry conditions. All the ‘Wishes’ tend to prefer a bit of shade in really hot conditions and can burn, in other words they do not like extremes. ‘Love and Wishes’ has similar breeding to ‘Wendy’s Wish’ but was bred deliberately. All these plants are patented which means you can only sell them by arrangement.